Patti LuPone & Edward Seckerson | Dame Judi Dench & Gyles Brandreth| Charles Dance |Kerry Ellis & Gaby Roslin | Jason Robert Brown| Anne Reid & Sir Derek Jacobi | Dame Patricia Routledge | Michael Morpurgo | Misha Glenny | Carlos Acosta & Mike Parkinson Jr | Simon Schama | The Stephen Sondheim Society Performer of the Year | and more! 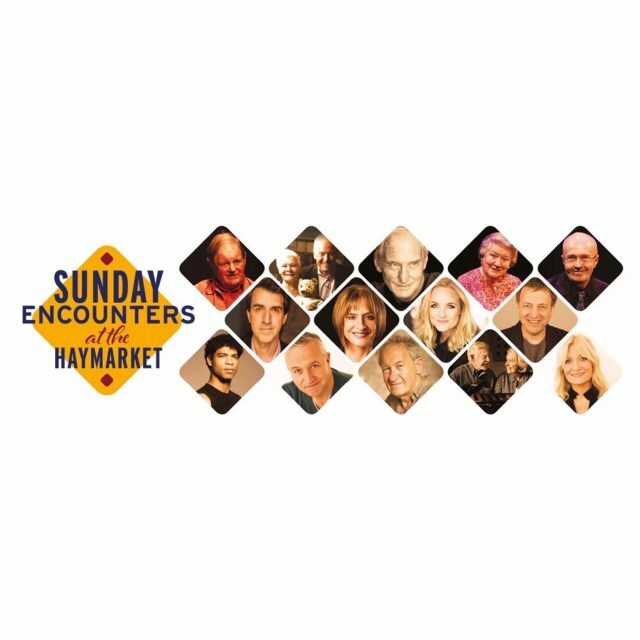 “Fane Productions are thrilled to be producing a season of ‘Sunday Encounters’ at Theatre Royal Haymarket: a unique collection of one-off encounters with some of the UK’s most inspirational and discerning voices from theatre, dance, comedy, politics and literature. In general, dark night programming of West End theatres has been of a sporadic nature, so it is a fabulous opportunity, and something of a first, for a theatre of such calibre to lease Sundays to an external producer for a full season of curated work. Working with Nigel Everett and his team at TRH has been a privilege. Fane Productions’ growing reputation for live spoken word and music events, and the obvious attractions of Theatre Royal Haymarket are proving a potent mix and the first ‘Sunday Encounters’ season is packed with famous names and faces from across the entertainment landscape.” James Albrecht, Creative Producer, Fane Productions. The programme includes many rare encounters: Dame Judi Dench interviewed by Gyles Brandreth in aid of Great Ormond Street Hospital, Patti LuPone in conversation with Edward Seckerson, Sir Derek Jacobi interviewed by Anne Reid, Carlos Acosta in conversation with Mike Parkinson Jr, Kerry Ellis sings and is in conversation Gaby Roslin, and Jason Robert Brown crosses the pond for a concert with special guests. Dame Patricia Routledge talks about her life in musical theatre, whilst Charles Dance talks about his life on stage and screen, Michael Morpugo comes to Haymarket for his 75th anniversary tour and Misha Glenny, the McMafia author and journalist, delivers a somewhat terrifying masterclass on organised crime and how it impacts on us all. Simon Schama: Wordy The Tour asks if words still pack a punch in the reign of twitter? The annual Stephen Sondheim Society Student Performer of the Year comes to the Haymarket for the first time, and for Curious Arts Curate London Curious, the creators and curators of the Curious Arts Festival, celebrate London in a series of compelling talks and workshops over one day with speakers including Iain Sinclair. With more to be announced in the coming weeks, ‘Sunday Encounters at the Haymarket’ promises an exclusive, mind expanding, diaphragm exercising, musically compelling season of one-off events from March – June 2019. Why spend your Sundays anywhere else? Founded by Alex Fane in February 2017, Fane Productions specialises in the production of bespoke live events for leading talent. Over 100,000 tickets were sold in its first year through events with the likes of John le Carré, Margaret Atwood, Nigella Lawson, Dolly Alderton, Stacey Dooley and Grayson Perry. Fane Productions also runs the programming at Live at Zédel putting on 700 shows a year and recently announced its own book festival – Words Weekend. The Theatre Royal Haymarket, which is owned by the Access Entertainment Group, was known originally as ‘The Little Theatre in the Hay’, is a Grade I listed building situated in the heart of the West End. Designed and constructed by John Potter in 1720 it is one of Britain’s most treasured theatres. Circa 1820, all the buildings on the east of the Haymarket from the theatre southward were rebuilt in connection with John Nash‘s schemes for the improvement of the neighbourhood. Nash persuaded the proprietors of the theatre to rebuild on a site a little south of the old one so that the portico should close the vista from Charles Street. The theatre seats 893 patrons and is the third oldest London Playhouse still in use.